All three Rollins Student Government Association (RSGA) presidential candidates declined an invitation to attend a debate, instead opting to host a public service event Tuesday afternoon. Candidates Nchedo Ezeokoli (19PH), Rosa Abraha (19PH) and Mahnoor Mahmood (19PH) sent an Oct. 26 email to Rollins students outlining their collective decision to not participate in the debate. The candidates wanted to “eliminate the divisiveness surrounding the decision to host a presidential debate,” according to the statement. About 35 students attended the candidates’ public service event. 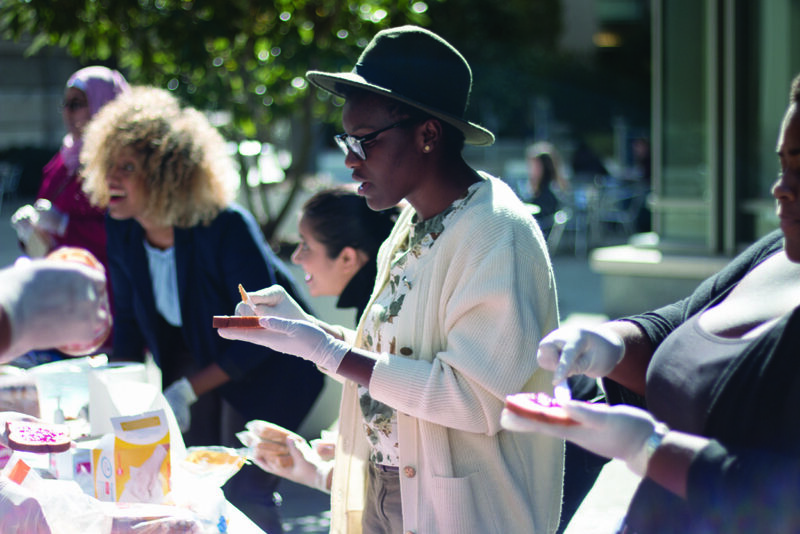 Candidates and attendees made peanut butter and jelly sandwiches to donate to Atlanta Inner-City Ministry and had conversations with other students. Because Ezeokoli said that she would not be able to attend the debate due to scheduling conflicts, the candidates agreed to not participate, so that one candidate would not have an advantage over another, according to all three candidates. Sana Charania (13Ox, 16C, 18PH) and Christopher DeVore (18PH), the debate organizers, were willing to reschedule the debate because it conflicted with one of Ezeokoli’s classes. Ezeokoli expressed interest in attending a Global Health Institute (GHI) networking event that took place during the rescheduled debate, according to Charania. However, Charania and DeVore did not reschedule the debate again to accommodate for the networking event, as they believe that presidential candidates have to make tough decisions sometimes and prioritize their leadership responsibilities over social or networking events. Ezeokoli and Mahmood said they attended the Emory GHI Practicum Opportunities Fair Monday, the night the debate was scheduled. The fair helps students make connections to potentially find a practicum, a supervised practical field experience that is required for Rollins students to graduate. “I don’t think our education should ever come secondary to any debate that’s happening or anything extra,” Abraha said. In lieu of the debate, Charania and DeVore hosted a “Discourse in Public Health” forum, which was attended by about 50 people. None of the candidates were present. Charania and DeVore had worked to organize the debate, working independently of RSGA and with DeVore acting outside his position as RSGA Department of Health Policy and Management Representative. RSGA holds no official opinion or role in the debate, according to DeVore. Although Charania supports the public service event hosted by candidates, she said she does not see it as synonymous to public speaking and answering questions in front of a crowd. “Part of a debate is being able to articulate your views well while under pressure, and, as president, there will be high pressure times where you will have to address the whole school. How are you going to do that if you can’t answer questions about your platform?” Charania said. Executive Director of the Barkley Forum Ed Lee spoke at the forum that replaced the debate and said that debate is fundamental to democracy. Senior Associate in Biostatistics and Bioinformatics Paul Weiss said he was excited when he was asked to moderate the debate and disappointed when he found out it was canceled. One of the reasons the RSGA president did not want to hold a debate was to prevent putting stress on candidates from public speaking, the Wheel reported last week. As a result, Charania and DeVore organized a public speaking workshop with Michael Hussey (18PH) for the candidates to attend, but none of the candidates attended, according to Charania. Because Charania and DeVore had organized the debate, they chose Hussey to serve as a third party to work with the candidates. Debates are not required for elections by the RSGA Constitution. Presidential candidates are required by the Constitution to write a platform which are available for students to view on Google Drive. Forum attendees talked about creating a third-party organization to hold debates or petition to make debates mandatory. Chrystelle Kiang (19PH) saw the public forum as an important opportunity for people to come together and discuss solutions to concerns with RSGA policies. “This event was exciting for me because it’s nice to see that people care. It reflects to a national scale election and how all it takes are a few people who care to raise their voices and for people to not be complacent in the system. That’s how things get changed,” Kiang said. Mushtaq Dualeh (19PH) was glad the public forum took place despite the debate being canceled. Charania said she plans to vote no confidence in the election. “I don’t have confidence in any of the leaders, because I don’t think getting a piece of candy or a brownie or a hug or whatever gives me the adequate information to vote for someone,” Charania said. Voting opened for Rollins students Oct. 31 and runs through Nov. 3. Results will be announced Nov. 6.